Ahh, I love a Titleist Driver. Let's just get this out there: I'm a Titleist guy. (No, I'm not paid by them -- but if they want to make me an offer, I'd oblige.) However, I've played more Titleist clubs than any other brand. The reason I like Titleist is because when it comes to feel and workability, they always rule the roost. The 909 D3 Driver is no exception. The head is a 440CC which is more compact for shot making then those ugly player-improvement drivers. The driver is beautiful to look at down at address. It sets up a smidgen open, thus tempering your fears of hooking the ball. And the impact sound is very pleasing, not that obnoxious "tink" that you get with a lot of modern drivers. A word of warning: This driver is for the advance low handicapper that is looking for a workable driver. It is not real forgiving on the mishits, and you want to be able to swing this club down the line to really appreciate what it can do for you. Furthermore, you can find a lot more drivers on the market that will help you gain more distance. 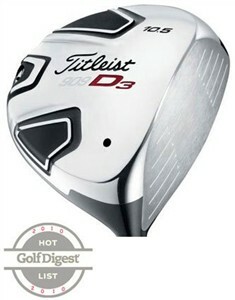 If you want a more forgiving Titleist driver, check out the Titleist 909 D2.